AGM Deciduous and very hardy (USDA zone 3,(-40 degrees Centigrade)) Eventual height to 60cm. A delightful and graceful fern, surprisingly hardy and robust. It requires a good moist humus-rich soil/compost, partial shade and good drainage. It is from the eastern half of North America. It spreads slowly forming a clump. 'Pedatum' means "bird foot", alluding to the radiating fronds resembling some birds feet. This fern has had a number of uses, the French imported it as a packaging bulk as it grows so plentifully in Canada. 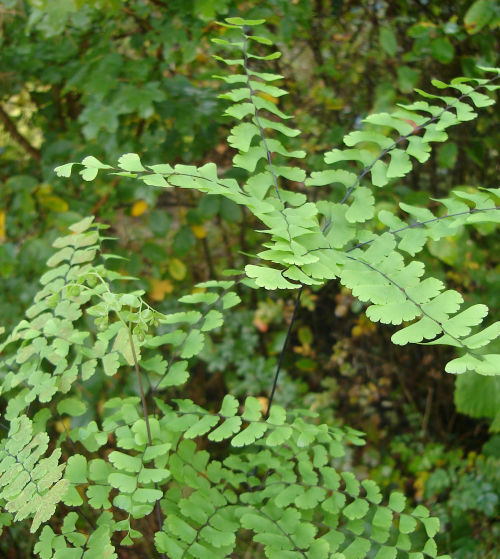 They also used it in the preparation of Capillaire instead of Adiantum capillus-veneris however the emetic qualities of A. pedatum meant that the resultant syrup had to be taken in moderation! Like A. capillus-veneris it is astringent when prepared with boiling water and had similar uses, though, as mentioned earlier, this fern was a better emetic. I haven't found out yet whether the products from this fern are better for baldness!